While people of German ancestry across Pennsylvania from Reading to Lebanon to Lancaster county go nuts for the pre-Lenten treat known as fasnachts (German for the night before the fast), Brauhaus Schmitz is offering up their own version right up until the kitchen closes on Fasnacht or Shrove Tuesday (also known as Mardi Gras). “Growing up, my school [in Reading] had fasnachts every Tuesday before lent,” Chef Jeremy Nolen says. 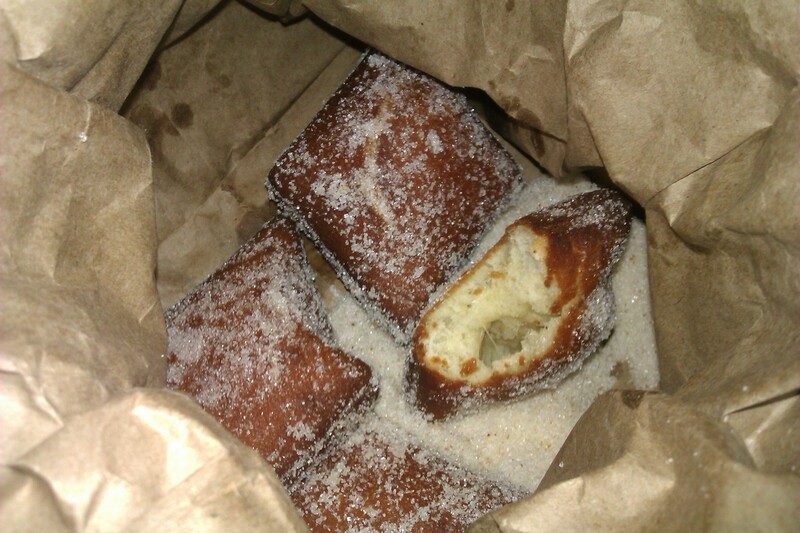 While these sugar coated fried doughnuts got their start in the homeland—as a way of getting rid of all the ingredients one gave up for lent—Nolen says he doesn’t think they’re very popular in Germany anymore, minus perhaps, some tucked away smaller villages in the south [there’s mention here of them being enjoyed at festival in Hausach, Germany]. But the tradition has been retained by people of German ancestry across Pennsylvania, including, the erroneously named Dutch Amish. Nolen offers another PA German favorite as another example of an immigrant community holding onto a culinary gem as the mother country moves on: scrapple. Originally called panhaus in Germany, Nolen says it’s something you don’t really find there anymore. As for fasnachts at Brauhaus, they use cooked potato, buttermilk, yeast, flour, butter, nutmeg, cinnamon, and mace to create any airy, ethereal doughnut. Cut into little diamonds and cooked in canola oil, they’re pillowy, with a light chew that gives way to a small chamber of air. In addition to sugar, the doughnuts are coated with an additional allotment of cinnamon and nutmeg—as well as vanilla extract—to match the flavor running through into the interior. While Nolen and anyone else will tell you that they’re not meant to be matched with beer, I had a problem, a not too unsettling problem (a similar problem occurred at Landbrot in NYC). 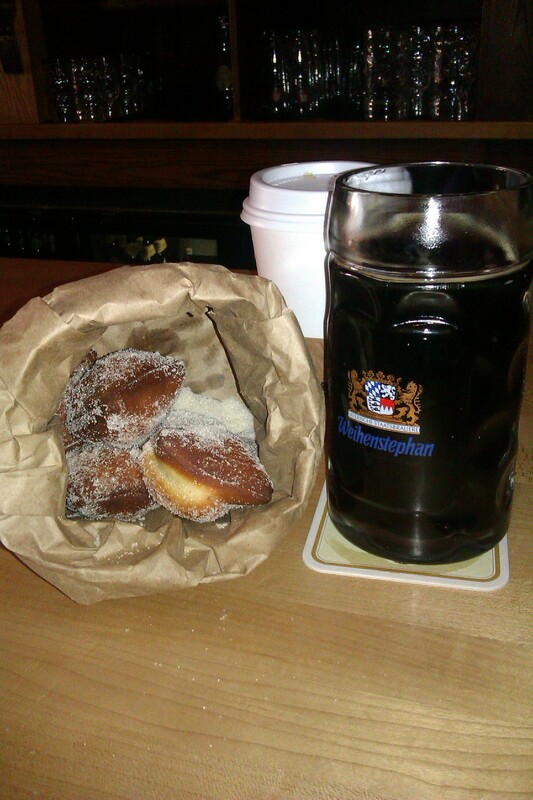 Having been served a brown bag of piping hot, sugar coated doughnuts, I was standing at one of the best bars in Philly. With their selection of German beers, it’s nearly a literal Stargate back to the homeland. So, what to get? With my doughnuts. Of course, I was thinking dark, malty German beer. The bartender is on the same track. He first suggests Spaten Optimator, but I want something more nuanced. Then, he nails it by offering up Weihenstephaner Korbinian, which brings a depth of sweetness via notes of honey and caramel on top of a malty body inflected with brown sugar. It matches perfectly with the spice of the doughnut, the sugars play upon the canola oil. While the doughnuts are far from greasy, the crisp, clean beer is the ultimate palate cleanser, and the experience is definitely something not to give up. ← A Moveable Feast: La Panarda at Le Virtú. 40 Courses, 9 1/2 Hours of Abruzzo Via South Philly. Yօu nwed to be a part of a contest for one of the best blogs oon thee internet. I am going to reϲommend this site!